January Journal: Day 9 — Ginger writes. When you see things from someone else's point of view, it's different. This past weekend, my mother-in-law had to use mine and TJ's shower one morning because the pipes in the garage apartment froze. The next time I took a shower, I imagined her view of the things in our shower. These are the soaps my son and daughter-in-law use. These are the shampoos. These are the masks and these are the shaving supplies. Maybe she paid little to no attention to these things, but I certainly did during my next shower. Somehow the knowledge that someone else may have paid attention to my things made me pay more attention to them myself. In our shower, the black soap is a charcoal soap that TJ and I discovered at a flea market in Brooklyn several years ago and have been ordering online ever since. It's a great face bar. The white soap is the Kirk's Castile Soap I buy from Vitacost as our everyday shower soap. If I could afford it, I would buy the Naturopathica face mask all the time. The Desert Essence mask isn't bad though. The Tea Tree Tingle is TJ's and the Herbal Essences with figs is mine. The Kiss My Face lavender shave gel is mine too. I keep my TeaTree Mint below, along with the Theraneem that I bought for lice prevention last year and still try to use once a week. The Burt's Bees is for when the kids use our shower. 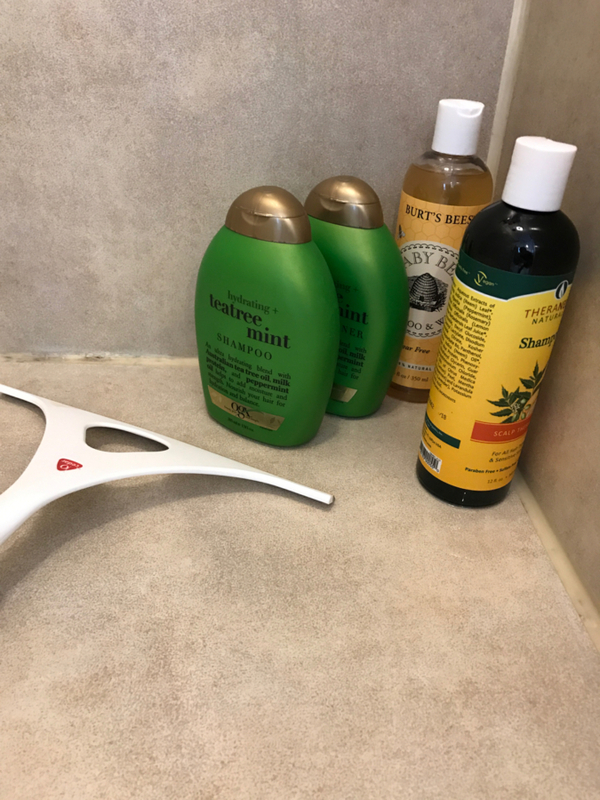 Did any of these products catch my mother-in-law's eye? Did she see where we hang our washcloths, and what print our towels are? Did she see all the clutter on my side of the sink and the non-clutter on TJ's side? Did she see the pages of Colossians on the wall? Did she sees the clothes piled on the side of the tub and the shoes stacked on the floor? Did she notice that I just cleaned the bathroom the day before (not planned, but good timing)? Did she turn on the space heater that I always turn on? Did she turn the bottles of shampoo around to see them better? I see it all better now too. I see each one of my choices as proof that I'm alive, taking up space on this earth, keeping clean hair and a clean body, thankful that all of these decisions have already been made, wondering how long till something runs out, even sometimes wishing for a miracle like the widow's flour and oil that never ran out (2 Kings 17): that my Naturopathica face mask would last forever. These truths go beyond shower supplies. When I see my kids as if I was someone else seeing my kids, my view is expanded. I see their endearing little selves in a way that I sometimes forget to notice. Just as my tea tree shampoo is nothing but a green bottle on a shelf, my kids are background scenery and background noise. I forget to turn them around and really look at what they say, how they shine. I forget to see TJ that way too. I forget to be thankful for all that becomes too familiar. I don't see the beauty of my kitchen, or my cutting board, or my knives, or my hands. I jump in the shower and out, using a bit of this, a bit of that. I forget that things smell good and that hot water is the long end of the stick. But here's the trick. To help us remember that nothing is background noise, we can pretend to be someone else using our shower, someone else seeing our lives, our kids, our houses. We can look in the mirror with someone else's eyes and see our hair, our earrings, even our cold sores. All reminds us we're alive. Nothing goes unnoticed. And now a shower wakes us up in more ways than one.